We get a ton of questions from business owners and fellow SEO’s related to all aspects of digital marketing. Every so often we come across questions that seem to be asked over and over again. When we come across these questions, and there is no resource to point people towards, we like to create some content to fill that gap. A recent example was a post that we did with the goal of answering a question we get all the time that is something along the lines of “Which Google booking partner is the best for my business?” which we attempted to answer with our post comparing the Google booking partners. Recently we have been getting a lot of questions related to Google Posts. There has been a bunch of great content written recently about Google Posts including Ben Fisher’s post on How to Create a Google My Business Post That Will Win You More Customers and the case study that Joy wrote on how Google Posts impact ranking. One of the questions we have been getting lately is “Which companies offer Google Posts as a service?” In this post I attempt to compare five companies that offer Google Posts as a service. This is by no means a comprehensive list of all the companies that offer Google Posts. 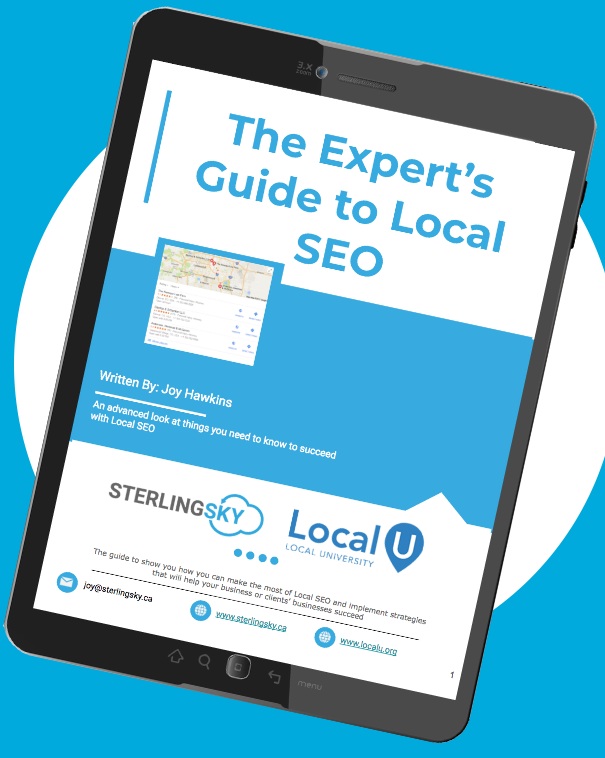 The companies that we included in this article are the ones that repeatedly came up when I asked people in the local search community which companies they had used or had heard of. The table below compares things like prices and whether or not the company offers a white label solution. Below the table I have added some additional information about each service and finally we chose our top three. * Google Posts are included as part of their existing platform. Sendible is a platform that “is simply the best way for teams to manage social media for multiple clients — and get results”. The platform allows you to publish content across most well known social media platforms and you can do it in bulk or on an individual basis. When I was communicating with their customer service representative it became evident that Google Posts as a service was not currently their domain expertise. It seems more like something that they have just recently learned about and might not be fully up to date on all the nuances just yet. They did push their white label solution several times in my communication with them. Find out more about their features and white label solution here. Yext, like Sendible does not offer Google Posts as a stand alone service. It comes as part of every package that they offer. Yext uses the Google API and you can do your posts directly from the Yext Knowledge Manager which can be connected to your Google My Business listing. Yext does not integrate tracking URL’s to track performance of the posts specifically. They do offer a white label solution and there is no limit to how many posts you can do per month. I think Yext is a great overall platform for controlling your business data across the web. If I was already a Yext partner I would absolutely be utilizing their Google Posts integration. But I wouldn’t purchase a Yext subscription if my primary goal was managing Google Posts. What I like about Steady Demand is that Google Posts and Google+ is their main domain expertise. Unlike Sendible, Google Posts is their core service and not an afterthought. Steady Demand offers Google Posts exclusively as a white label service to other marketing agencies. 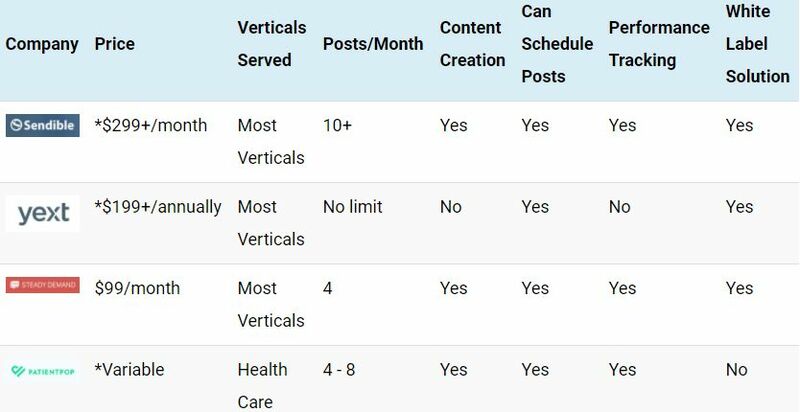 Steady Demand offers Google Posts across all verticals except hotels which are currently excluded from doing Google Posts. Additionally what I like about Steady Demand is that they have a team of writers that are skilled writers and also trained in keyword research and semantic search concepts. If you have a client that is in the health care vertical PatientPop is going to be your go-to service provider for Google Posts. Google Posts are freely included as part of their platform, which encompasses scheduling (with optional integration with the practice’s office software), feedback/reputation, profile management, and website. The content is templated, but uniquely tailored to include the practice name, category, and location. If a customer works with their success manager, unique posts can be planned. PatientPop was able to launch using Google’s API the day after Google rolled out the features in the Google My Business API. They use UTM parameters to track the content, image, and post event click thru rates. PatientPop’s solution is only for PatientPop customers and does not offer a white label solution. A Servant’s Heart has been providing Google Posts service for their SEO clients since last November. They offer this as an a la carte service for others now as well. For their SEO clients they usually tie the posts into a theme related to the latest new content that they have published on the clients’ websites but they also have the capability to provide this service for others as well. Steady Demand – The reason they are our number one pick is because Google Posts is their main focus. If you had a German car would you take it to Midas or the mechanic that specializes in European auto repair? If you offer Google Posts as a service and are interested in being included in this post feel free to reach out to me. Didn’t realise that it was possible to schedule Google My Business posts yet, so thanks for highlighting this Colan. We currently use a blend of both Hootsuite and Buffer for social media management. Are you sure Buffer allows scheduling for GMB posts as I can’t find anywhere to connect it up? Google+ posts for profiles & pages yes … but not GMB posts. Hey Nick, they use the Google API so they should have the ability to schedule posts. I would double check with their support team but that is the way it was communicated to me when I spoke with them. Hey Phillip, I made it clear when I chatted with their support rep that I was interested in Google Posts specifically. So yes it sounds like the ability is there but as I mentioned it kind of seems like an afterthought and not something that is a core function of their platform. So it could use some more digging for sure. Hey Phillip, you are right! I removed Buffer from the post and I asked them if it is even on their road map and it’s not. They thought I was referring to G+ posting. My apologies for the miscommunication. Gret post Colan, Also didn’t know this was out there. I am curious to know whether they schedule the post with image and tags. I’m the founder of Publer, a social media management app, and we recently added support for Google My Business. I was wondering if there’s a way we can be added to the list, considering we’re offering a more reasonable pricing. With Publer you can schedule your GMB posts, Facebook posts, Tweets and LinkedIn updates as well as track their insights, all from the same spot. I had completely missed your reply. Probably since it was the end of the year. I just sent you an email.